When approached to handle the indoor and outdoor kitchen spaces for a new ground-up home build, Homeowners Design Center and its expert staff went straight to work. 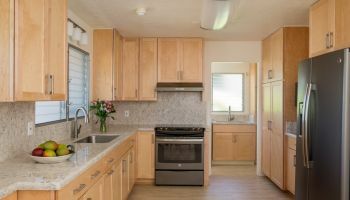 They sat down with local Hawaii homeowner Mr. Shimoda and not only went over the architectural plans, but also spoke with Shimoda about his personal wishes, likes and dislikes, in order to assess exactly what he was looking for in a home. The work also involved designing several of the bathrooms. 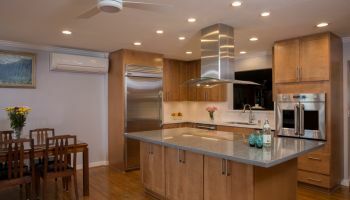 “Every once in awhile we're able to help a client with a brand new kitchen,”explains Randall Omoto, Sales Manager at Homeowners Design Center. Omoto adds that, "They'll come (to us) with architectural plans... and from there we're able to plot the kitchen down and then give them a review of what the kitchen is going to look like... We're able to (3-D) render the kitchen to exactly what the architect had envisioned," so that the homeowner can see if it's the kitchen that they had wanted. A large open kitchen space to accommodate and entertain numerous guests. Omoto says that being able to create a 3-D rendering of the kitchen before it's even built is extremely helpful. It gives foresight into what the final kitchen looks like before any amount of money is ever spent, which in turn provides Homeowners Design Center’s patrons with the peace of mind that they will be getting the perfect kitchen that fits their preferences. In designing the indoor and outdoor kitchen areas of the home, Shimoda wanted two kitchen and cooking spaces where he could enjoy entertaining in a practical yet aesthetically pleasing way. They accomplished this by incorporating built-in and customized options ideal for Shimoda and guests, such as a wine captain and state-of-the-art beverage center to augment the refrigeration of refreshments. He also wanted an open space so that if he wanted to entertain and have guests over, the kitchen could accommodate a lot of people. However, he also wanted it simple enough so that it would be easy for him to prep and cook for himself. The accent and task lighting, along with the countertop and cabinet colors, were chosen to create an inviting feel for Shimoda’s guests. The kitchen cabinets are a manufactured line where everything is made at the factory. The advantage here is that instead of an assembler bringing in parts from outside, the manufacturer is able to make the wooden cabinet doors, and all the other parts, inside their facility. This allows them to hand-select the wood used to make the cabinet doors, allowing for an even and consistent look in the doors. These cabinets were installed in both kitchen spaces. The lighting chosen (accent lighting above the kitchen island and task lighting under the cabinets) also served to pair nicely with the natural granite countertop, as well as to set a warm and inviting tone for welcoming guests. The soft color tone of the travertine flooring added to the appeal. The same type of planning for the indoor kitchen went into building the outdoor kitchen. The same type of planning that went into designing the indoor kitchen was applied toward the outdoor space. Answers to the lifestyle and preference choices for an outdoor kitchen space went into the design of Shimoda's poolside oasis only steps away from the house. The space provides for practical outdoor entertaining, which includes a stand-up eating counter, built-in BBQ grill, large utility sink, extra refrigeration and a granite countertop and prep area. A pleasant, private, outdoor getaway within paradise. An outdoor oasis just steps from his home. To learn more about Homeowners Design Center and how they can help you with your home or kitchen building plans, click on wherever you see their name.